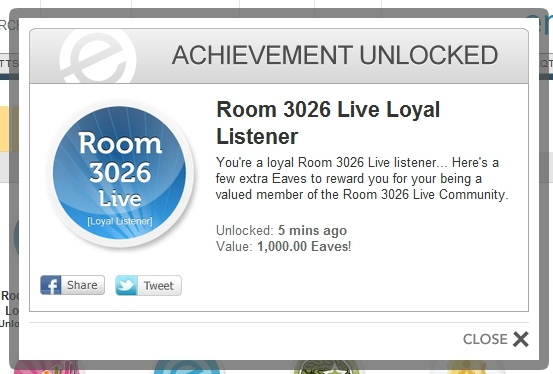 Today, on Room 3026 Live, we proudly announced the official Empire Avenue Limited Achievement for the first 50 loyal listeners. All of this was made possible by Mr. Aaron K. White, Empire Avenue's Director of Digital Alchemy, who took some time to talk with us back in May about the growing social network. In case you missed that episode, take this opportunity to listen now. To redeem this very limited achievement, stop by http://www.empireavenue.com/shop and type in the Coupon Code referenced in today's episode. If you're not yet playing Empire Avenue, make sure to check me out at http://empireavenue.com/?t=14uyapx0 and receive 2,000e for FREE (that's virtual money). Special Note: I would personally like to thank Aaron for giving our community such an awesome gift. It was totally unexpected. Thank YOU!